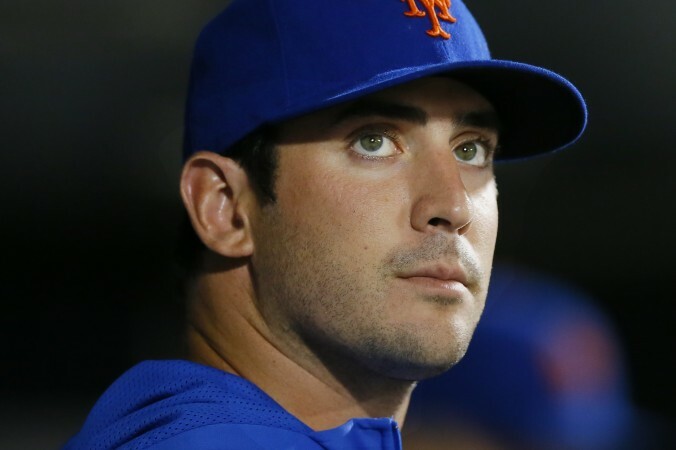 April 25, 2015, Bronx NY- The Mets are back on the winning side after a phenomenal start by the “Dark Knight” himself Matt Harvey pitched an almost flawless 8 and 2/3 innings coming one out short of a complete game. In his first start of his career at Yankee Stadium he was able to out duel a former CY Young winner in C.C. Sabathia. His only two blemishes was the miscue on the field that let the Yankees tie the game at one. Murphy had a third consecutive miscue when he failed to cover first base on a bunt causing the runner to be safe. Harvey gave up a homerun to Mark Teixeira who looks to be finding his swing in the series. He has hit 3 HR’s in the series bringing his total to 8 HR’s on the season trailing only the Seattle Mariners Nelson Cruz. But the day belonged to both Matt Harvey and Juan Lagares respectively. Harvey was able to pitch lights out for the Mets who’s pitching is the reason why they are (14-4) . Harvey improved to 4-0 on the season and 8-0 in his career in the months of March and April. In his 40 career starts he has a 2.45 ERA 2nd best in franchise history only to the great Doc Gooden. His performance today helped him pass the great Jerry Kooseman and “the franchise” Tom Seaver. Lagares was 4 for 4 for the second time in his young career and has an 8 game hitting streak bringing his season batting average to .299 he has been the catalyst of the season not only defensively but offensively in the last seven games. C.C Sabathia and the Yankees struggled all day to muster anything against the Mets. C.C. Sabathia is 0-4 this season losing the first four games of the season for the first time in his career. He never seemed to be locked in giving up a solo shot to Lucas Duda in the top of the first. In the 4th inning the Mets had their way with Sabathia tagging him for four runs all with two outs. Lagare brought Daniel Murphy home with a triple that carried away from Jacoby Ellsbury who was able to make an outstanding grab the play before. Wilmer Flores then followed with a bloop single to center and rookie cather Kevin Plawecki capped the fourth inning with his first career HR which was a no doubt line drive to left field. The bleeding for Sabathia did not stop there as he gave up a 6th inning to Eric Campbell and a leadoff single to Lagares who eventually scored to end Sabathia’s night with 7 earned runs. Tomorrow is the last game of the first subway series of the season as Niese battles Eovaldi on a nationally televised ESPN Sunday night baseball. Like the first two games of the series the crowd will be rowdy as both teams will play for bragging rights until September when the Yankees come to Queens. Hopefully the hype will be as good as this one and both teams would have clinched or are competing to clinch a post season berth. It has been 2 years since the Yankees have made the postseason and 8 for the Mets so tomorrow everything is on the line may the best team win.